Jethro, the priest of Midian, Moses’ father-in-law, heard of all that God had done for Moses and for his people Israel, how the LORD had brought Israel out of Egypt. 2 After Moses had sent away his wife Zipporah, his father-in-law Jethro took her back, 3 along with her two sons. The name of the one was Gershom (for he said, “I have been an alien1 in a foreign land”), 4 and the name of the other, Eliezer1 (for he said, “The God of my father was my help, and delivered me from the sword of Pharaoh”). 5 Jethro, Moses’ father-in-law, came into the wilderness where Moses was encamped at the mountain of God, bringing Moses’ sons and wife to him. 6 He sent word to Moses, “I, your father-in-law Jethro, am coming to you, with your wife and her two sons.” 7 Moses went out to meet his father-in-law; he bowed down and kissed him; each asked after the other’s welfare, and they went into the tent. 8 Then Moses told his father-in-law all that the LORD had done to Pharaoh and to the Egyptians for Israel’s sake, all the hardship that had beset them on the way, and how the LORD had delivered them. 9 Jethro rejoiced for all the good that the LORD had done to Israel, in delivering them from the Egyptians. 10 Jethro said, “Blessed be the LORD, who has delivered you from the Egyptians and from Pharaoh. 11 Now I know that the LORD is greater than all gods, because he delivered the people from the Egyptians,1 when they dealt arrogantly with them.” 12 And Jethro, Moses’ father-in-law, brought a burnt offering and sacrifices to God; and Aaron came with all the elders of Israel to eat bread with Moses’ father-in-law in the presence of God. Jethro, called Reuel in chapter two, re-enters the story and brings with him Moses’ wife and two sons. While we aren’t told exactly when Zipporah returns to her father-in-law’s house with her children we last heard about her and Gershom (their first-born son) in chapter four on the journey back to Egypt. There could be any number of reasons for their separation including: to protect her and her two sons from being able to be used as captives by Pharaoh, to prevent Moses from being distracted from his task for the time, to allow Moses to establish his authority among the Hebrews without his foreign wife being present, or perhaps Zipporah was pregnant and it was easier for her to give birth away from the stresses of the exodus journey (based on Eliezar’s name) and we could imagine many other reasons but ultimately the text remains silent on this. We have a separation of an unknown period and what appears to be a joyous reunion. The relationship of Moses to Jethro is one of respect and honor. 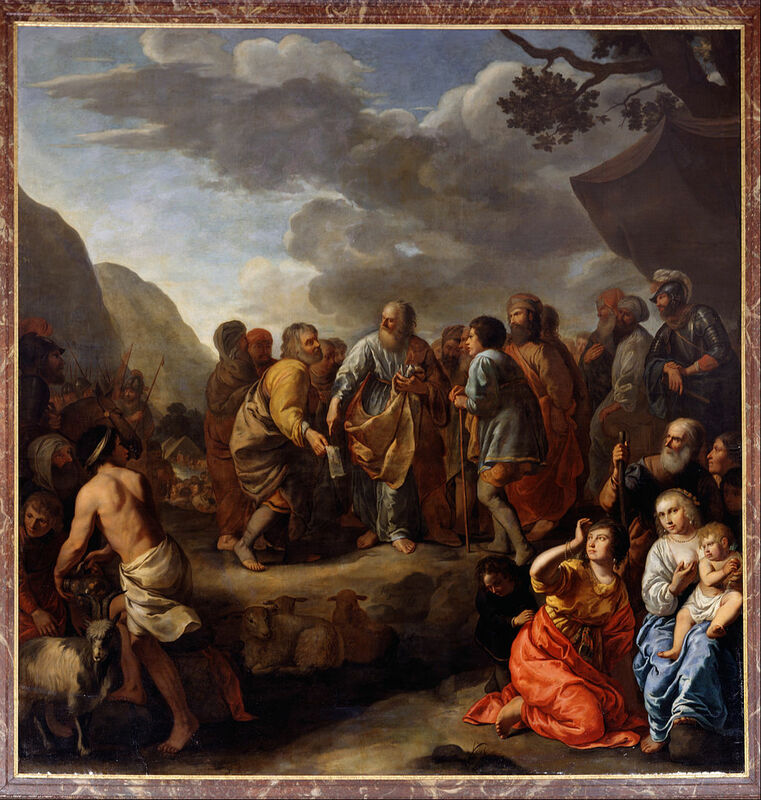 Moses’ actions upon Jethro’s arrival convey respect and welcome. 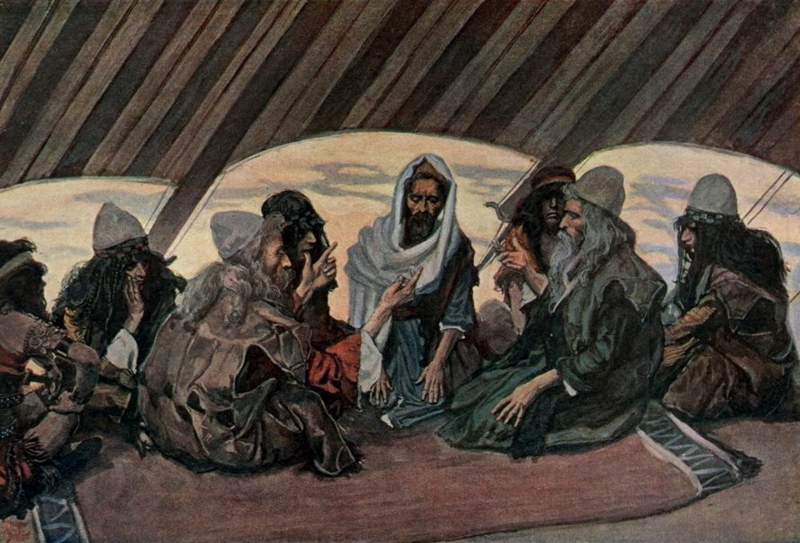 He is welcomed into their camp and into Moses’ tent with warmth. Moses tells the story of what the LORD has done and how they have journeyed to this point and Jethro offers his blessing. One interesting thing to notice in this passage is the blessing that Jethro offers to the LORD in comparison to the first commandment. The first commandment begins with the statement of what the LORD has done in delivering the people from the land of Egypt and then states that the people are to have no other gods before the LORD. Jethro also begins with blessing the LORD who has delivered the people from the land of Egypt and then exclaims his new knowledge that the LORD is greater than all gods, because he delivered the people from the hands of Pharaoh. Here a foreigner demonstrates before the people what the faith of Israel will look like in the future. Like Melchizedek in the book of Genesis, he becomes one of the people of the nations that point to the LORD the God of Israel. Secondly, Jethro becomes the first in the book of Exodus to offer a sacrifice to God after the departure from Egypt. This is increasingly surprising, as Carol Myers notices, since the justification give to Pharaoh multiple times in the beginning of Exodus is to let the people enter the wilderness to offer a sacrifice to the LORD their God. (Myers, 2005, p. 137) Yet, it is a priest of Midian who before Moses, Aaron and the elders models what this sacrifice to God might look like. As I mentioned when I was discussing Psalm 29 the Jewish people were not afraid to uses the praises uttered about other gods and modify them to talk about the LORD the God of Israel. Here is another time where a faithful outsider, Jethro, demonstrates to the people of God what a life of praise can look like. Within this passage we have one of only two places in the first five books of the bible (or torah) where the phrase “not good” is used. Throughout the creation narrative in Genesis one we hear God say repeatedly that is was good, but the only other place where the phrase “not good” is used is Genesis 2: 18 where God says it is ‘not good’ for the man to be alone. (Sacks, 2010, p. 128) Here also it is ‘not good’ that Moses is alone, here he needs appropriate partners for his own good and for the people’s. The critical task of finding officers, people who can be trusted to hear the people’s concerns and to respond fairly and who are not going to be vulnerable to bribes or coercion makes the life of the people of Israel possible. Here these officers are not given the title of judge, and there are probably several reasons for that. The office of judge in the people of Israel’s history gets developed in the times between Joshua and the time of the kings and the judges are people who lead the people for a time and have more of a Moses-like role than a purely judicial one. Also, throughout the book of Exodus, the people has been referred to in a military manner. Within many military units the commanding officer has legal responsibilities for those who serve under them, for example under the Uniform Code of Military Justice (or UCMJ) which provides the basis for the legal system used in the U.S. Military the commanding officer does hear cases and assign punishment. In disciplinary matter the commanding officers is judge and jury while still being the commander. These people who will mediate the commands and instructions of Moses to the people are foundational to the emerging structure of the people. Moses role becomes one of intercession, instruction and of finding subordinate leaders. Moses will continue to stand between the people and the LORD their God and this will become an increasingly critical role as the people continue their journey. Moses will also become the teacher of the law that is about to be given as well as interpreting the law to the people. Moses will continue to have to teach the people how they are to live and what they are to do. But Moses cannot do it on his own, he will need multiple leaders to share the burdens and responsibility of leading the people of God. Sometimes this is the hardest task: both finding and trusting these new leaders. I, and many other leaders, struggle with this portion of leadership-with equipping others who will not have the same amount of training and experience that you do. Yet, this worldly advice was deemed important enough by the people of God that it was included within their scriptures. This entry was posted in Biblical Reflections, Exodus and tagged delegation, Exodus, Exodus 18, faith, Jethro, Leadership, sacrifice, worship. Bookmark the permalink.